We recently moved back to the city from the gold-mining town of Julian, CA, located in San Diego County. 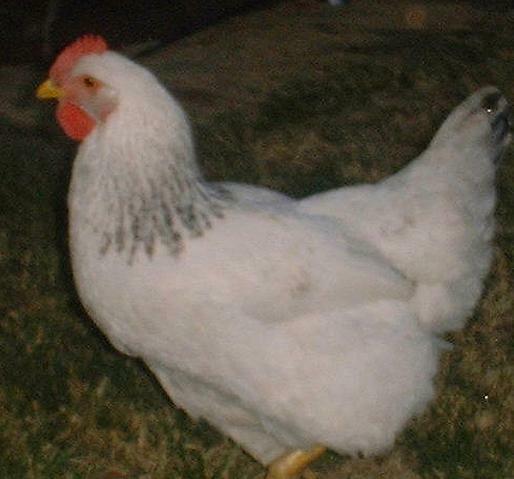 The chickens we had on our ranch/farm were well suited to the nearly mile high climate, and cold winters. We had to adopt out the flock of layers to a new home, and dearly miss our feathered friends. Here are some photos of them, free ranging during the day, and safely in their coop at night. There are all sorts of predators in the high country: coyote, bald eagles, chicken hawks, bob cats, and foxes. 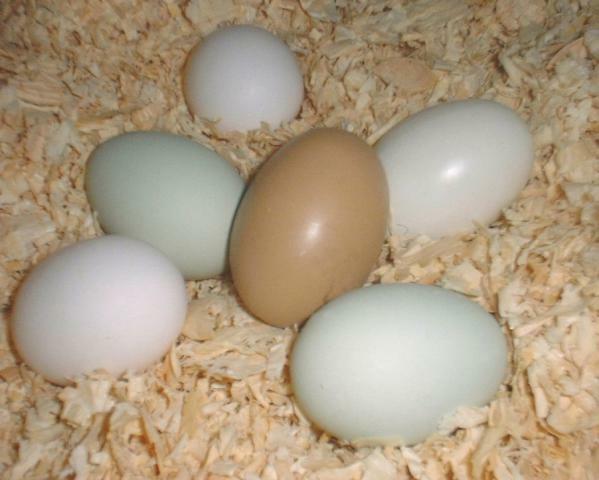 This is Weston, an Americauna mix, laying blue-green eggs. 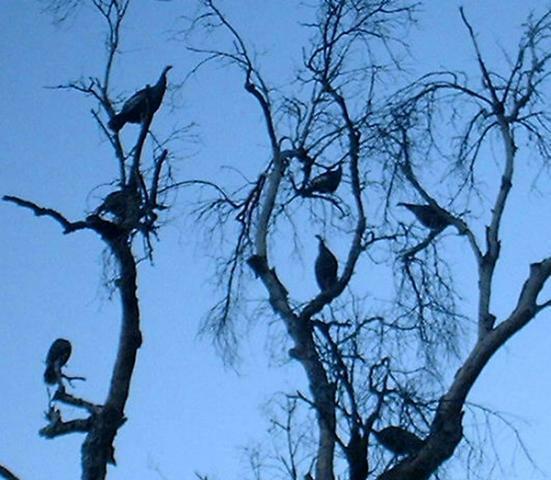 Our property was home to at least 50 wild American Rio Grande turkeys. They had been re-introduced to the area, through a program, after years of over-hunting. They roam right next to the dog yard, unafraid, and of course, no hunting allowed. 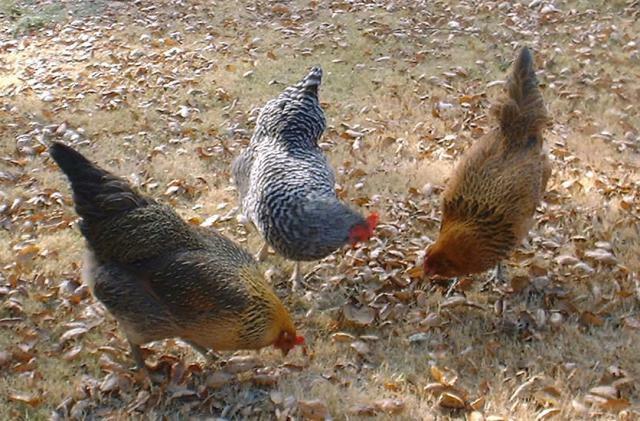 They loved the wild oat grass, oak mulch, and sometimes, my handouts. 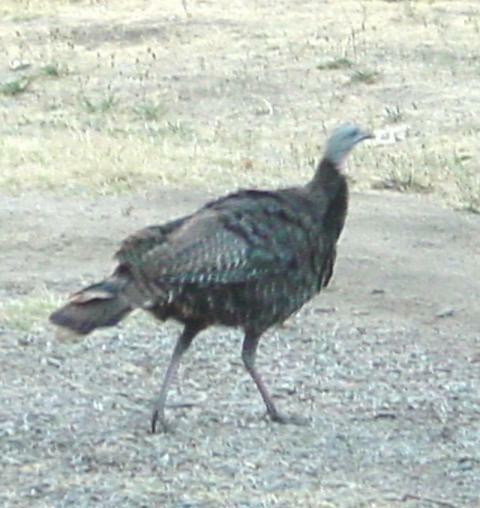 Wild turkeys can fly, and roost in trees at night. This shot is a tree about 30 feet from my kitchen window. 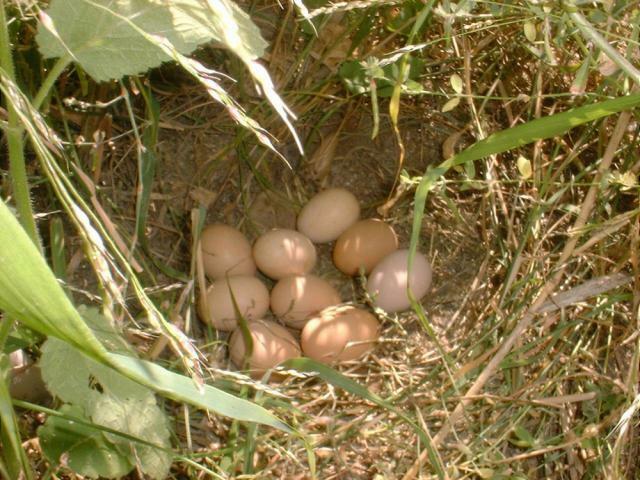 These were from Ramsay, a Barred Rock, our first girl to begin laying, who surprised us with this bunch hiding less than a foot away from a dessicated carcass of a hawk, who looked nearly exactly like her! I was out near our creek bed, calling for her, and saw the dead hawk and shrieked, fearing it was Ramsay. Then I heard a faint cluck-cluck-cluck, and discovered her and these gifts. The poor hawk must have been hunting my flock, and flown into a tree and broken its neck; no other damage to it was noticed, but it was completely dried out when I found it, as if taxidermied. 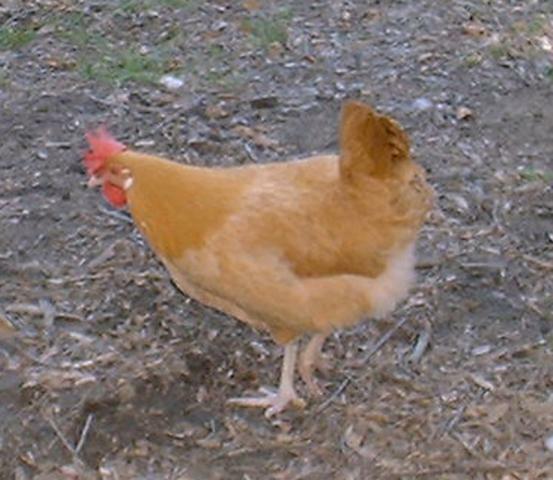 We loved this Buff Orpington, even though she was smaller than normal, and had a slight deformity. She had a gentle nature and came when called. 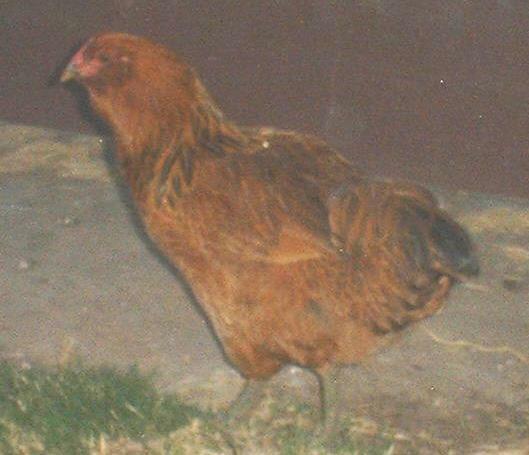 Our Delaware chicken was the victim of a swift coyote attack, whilst free-ranging right next to the house, during daylight hours. RIP, Delaware! 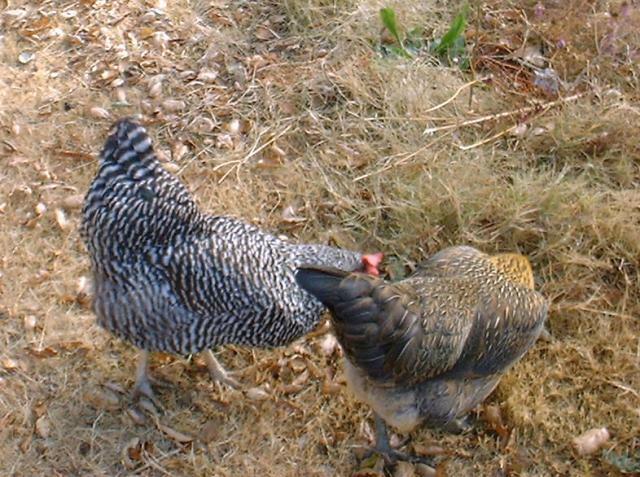 We are in the city again, and the next part of our urban homestead is to add chickens to our family. We are in the planning stages of the coop area, and hope to do the project with salvaged, free materials, as much as possible. Anyone in the Orange County, CA area with info about getting peeps, please email us. Thank you.